It seems that Old Grand-Dad 114, distilled and bottled by Beam, has developed a bit of a cult following, at least among those bourbon drinkers that also peruse message boards. 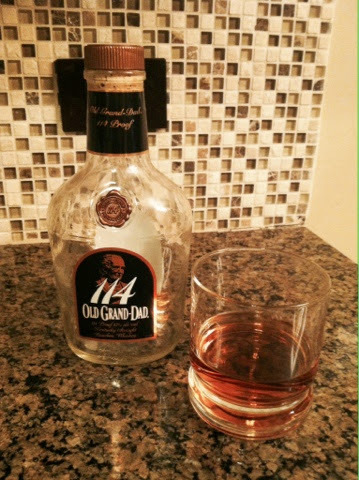 I have frequently seen OGD114 lauded for being a good to great sipper at a very good price. After the holiday spending, an affordable sipper was just what was in store, so I finally grabbed one to see what all the fuss was about. One such message boarder recommended that I open it and let it sit for a few days before trying. I'm not one for such patience, though, so I cracked and poured. My first drink was enjoyable, but not unlike most other lower-priced bourbons. At a proof of 114 (as the name would imply), it had considerable burn, along with strong rye and oak flavors. It was sweet up front, which made the burn easy to deal with, and made this an enjoyable drink. I did let it sit for a couple days after that, however, just to see how things would change. I was very pleasantly surprised at the transformation of the flavor in just a couple days. While the oak and rye were still prominent and heavy on the tongue, they were complemented by a distinct cocoa butter taste that coated my mouth. It remained very sweet, and in fact probably got a bit sweeter, adding a maple syrup flavor to the mix as well. The flavors did not necessarily blend together. Rather, each flavor seemed to stand out on its own, in contrast with one another while at the same time going together perfectly. It seems like a very ambiguous description, I know. But so often when I drink bourbon I taste the common elements like the corn or the rye, along with hints of other flavors that are almost fleeting. Here, I tasted oak, followed by what was certainly rye spices, all while distinctly noting the butteriness that lingered. This is an excellent whiskey for what it is. It's affordable because it's not overly complex or aged for many years. But, as far as "affordable" whiskeys go, I'd put it right at the top.